Byron's bean patty burger: an oldie but a goldie. What makes a good veggie burger? As there’s no meat patty involved, what should take its place? It depends who you ask. At one extreme, a burger made from 'lab-grown meat' was unveiled in London a few years ago and hailed as the future of 'meatless meat'. (Whether such 'cultured meat' should be considered vegetarian is another issue entirely). On the other hand, there are those unimaginative chefs that simply slap a few slices of mushrooms or halloumi cheese inside a bap and call it a burger. We spent several weeks chomping through the capital's vegetarian burgers, and discovered the traditional meat patty replaced by everything from pâté (well, almost) to pakora. There are wildly different takes on what a veggie burger should be, and something to suit every taste and budget. Here's our pick of the best. Roti Chai. 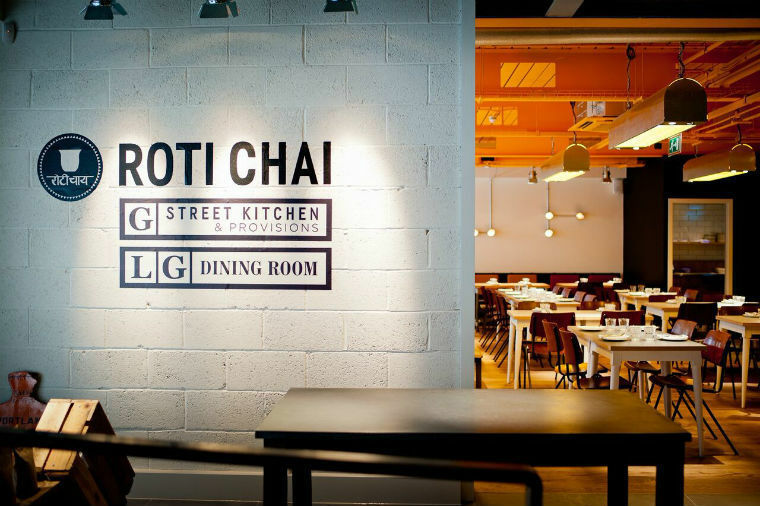 It's the ground floor Street Kitchen that serves bun tikki. Vibrant with Indian street food flavours, the Amritsar-style potato tikki burger at the casual yet modern Roti Chai is a joy both in terms of taste and good looks. Delicious, lightly spiced sultana-studded potato patty is topped with salad leaves, red onions and pomegranate seeds, snuggled inside a good toasted bun. There's a small pot of tamarind chutney on the side; and a cup of their lovely masala chai is the only other thing you'll need. The restaurant is tucked into a little alleyway opposite Selfridges and is an ideal place to meet friends. Downstairs, the Dining Room offers a more traditional sit-down restaurant experience, but for the burgers and relaxed street food style, you'll want to opt for the Street Kitchen upstairs. We're addicted to the rosemary salted chips at this friendly, handsome restaurant chain — and the veggie burger you should order to accompany them ain't bad either. At Honest Burgers, the mildly spiced cauliflower and sweetcorn pakora (we couldn’t really taste the tomatoes and shallots) sits cosily inside a pretty good bun. We love the coolness of the tasty, raita-like cucumber and coriander yoghurt against the kick of hot sauce. The fritter was a bit overcooked on our most recent visit, but nonetheless this is one of the tastiest and most imaginative veggie burgers in town. Their vegan plant burger is a knockout too. Honest Burgers, 189 Portobello Road, W11 2ED. There are many other branches around London. Theportobello 'dig it' mushroom burger at Patty & Bun. Mercifully free of faux Americana — but popular with hipsters and tourists — this expanding burger chain now has venues in all corners of London. The veggie burger at Patty & Bun is a braised, lightly breaded portobello mushroom stuffed with garlic and parsley butter. The breadcrumb coating is thin, which prevents it from being stodgy. The hefty patty comes in a good toasted brioche bun that's light yet substantial enough to stand up to it. The relishes are generous and don't make the burger soggy. They include cheese sauce, tarragon mayo, coleslaw and crisp lettuce — and you'll also need chilli sauce or mustard to cut through all that cheese, butter and egg extravaganza. The burgers come in greaseproof paper bags; no crockery here. One of the most enjoyable veggie burger experiences in London, and there's now a vegan option too — The Whoopi Goldburger. Patty & Bun, 55 Goodge Street, W1T 1TQ. There are several other branches including Borough High Street, White City, Liverpool Street and Hackney. 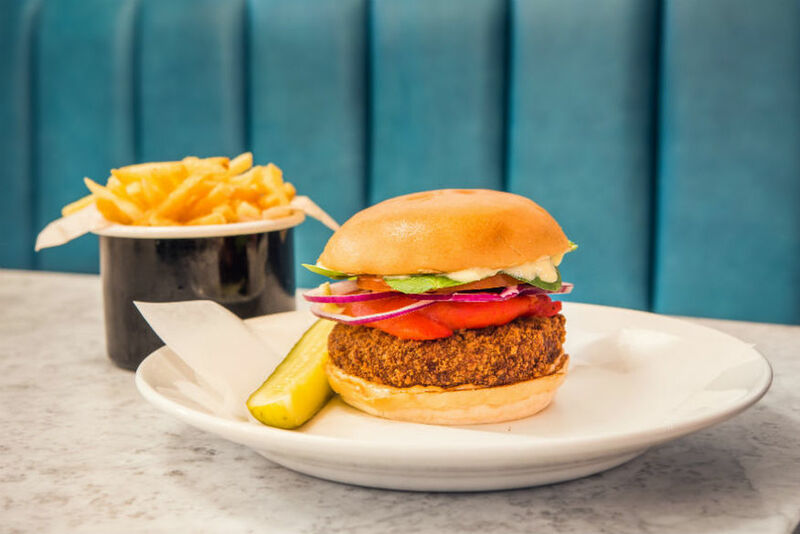 One of our favourite veggie burgers in London is this mock chicken burger, which takes pride of place on Mildreds' contemporary yet compact burger menu. The Bourbon Buffalo Chicken Burger is all the quintessential indulgence that a burger should be, sans meat. Packed with mock chicken, ranch dressing, gherkins, onion and crispy lettuce, the tasty patty is dense yet light. It comes with the option of extra vegetarian and vegan cheeses. What makes it so special? Well, vegetarian patties often tend to be 'double-fried' — fried once and kept aside, then again when the customer places an order — resulting in overly brown, often burnt burgers. In contrast, this has a sparklingly fresh taste and appearance. The charcoal brioche bun adds a bit of drama to your dining and isn't distractingly sweet or rich either. Top marks. Mildreds, 200 Pentonville Road, King's Cross, N1 9JP. Other branches are in Soho, Camden and Dalston. Classic Indian potato burger: Dishoom's vada pau. 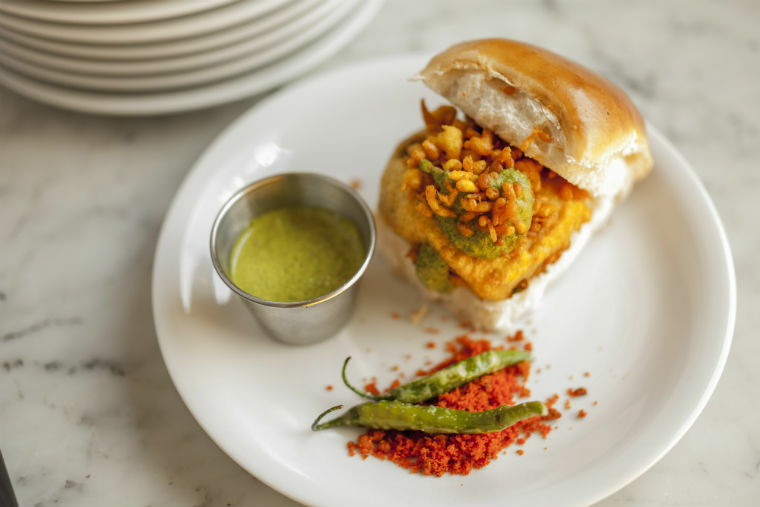 Not to be confused with the aloo tikki burger (also delicious), this slick Bombay café sells another variety of classic Indian potato burger: vada pau. This is a spiced mashed potato fritter, here distinctly flavoured with curry leaves, ensconced inside a mini-bun. It's topped with little crisp nuggets of chickpea flour batter that Indian kids usually fight over, which give the burger a good, varied texture. There are also coriander and tamarind chutneys; plus, as is traditional, 'red hillbilly ghati masala' to sprinkle over and a couple of fried green chillies. Dishoom, 22 Kingly Street, W1B 5QB. There are several other branches. You'll also find a deliciously garlicky version of this hugely popular Indian street food for a mere quid at the no-frills Shree Krishna Vada Pav cafés in Harrow and Hounslow. They also sell tasty dabeli — another famous regional variant on the Indian potato burger — plus a whole lot of other things like samosas and pakoras stuffed inside burger buns. Shree Krishna Vada Pav Café, 55 Station Road, Harrow, HA1 2TY. Other branches in Hounslow and Pinner. A good old-fashioned breadcrumbed bean patty, rarely seen elsewhere these days, can be found at this renowned burger chain. It's done very well indeed and has been given a contemporary twist. The bean burger itself comes in an excellent bun with a whole manner of less conventional treats, such as barbecued jackfruit, avocado, spinach and brightly-coloured rainbow coleslaw. If you want to keep things old school, the Cheese Melt burger comes battered and pickled to perfection (more pickles for us, please). You can oomph it up with extra cheese or chillies, but otherwise it's pretty simple with lettuce, mayo and onions the main accompaniments. The burger may be old school, but it's hearty and satisfying. Byron have oodles of branches all over London. Check the website to find your nearest. This American chain serves a tasty, basic veggie burger. There's nothing fancy about it: it's simply a fried, lightly breadcrumbed whole portobello mushroom filled with melted cheese. The bun is fairly bog-standard, garnished only with crisp lettuce, tomato and their house sauce. But it works — and, oh, the chips! The crisp, crinkle-cut, non-greasy fries are incredibly moreish. There's also a great selection of frozen custard shakes and ice creams on the menu. 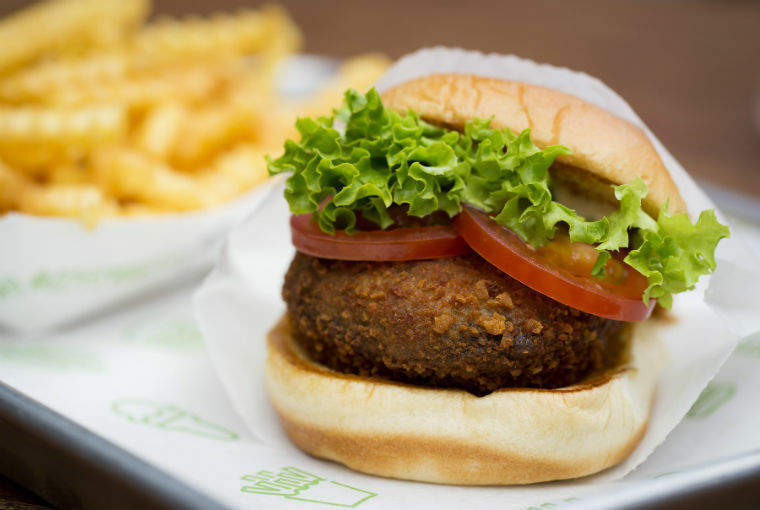 Shake Shack, 24 Market Building, The Piazza, Covent Garden, WC2E 8RD. There are a few other branches around London. 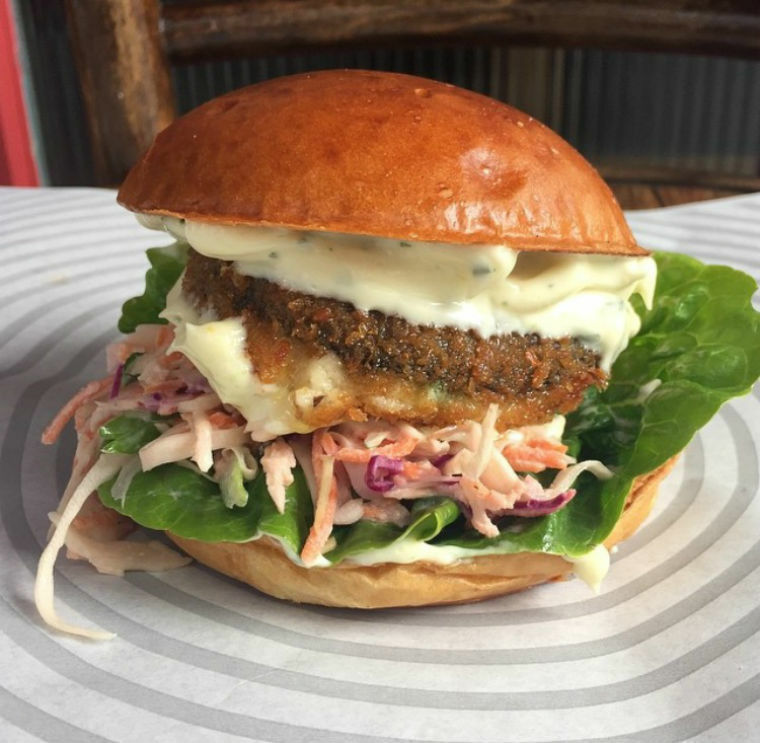 So which is your favourite veggie burger in London? Do you like old fashioned bean and lentil patties, or more adventurous flavours? And is it time to banish the brioche and bring back proper sesame seed buns? We would love to hear your thoughts.